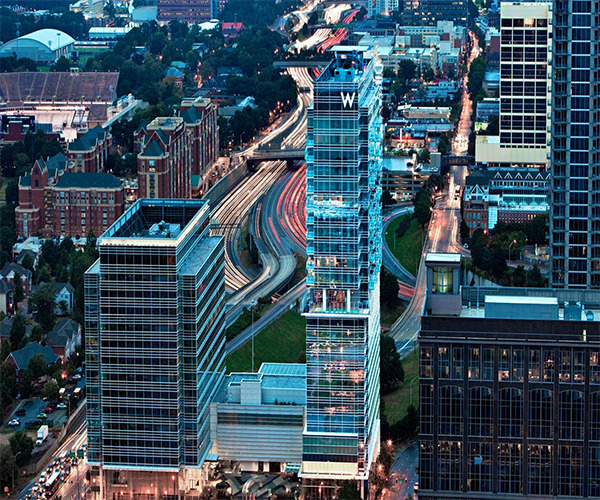 Surrounded by Atlanta’s most popular attractions, restaurants and nightlife, the W Atlanta-Downtown is a blend of hip, contemporary design and charmed Southern hospitality. This AAA Four Diamond-awarded boutique hotel offers guests a rich array of amenities and opportunities to relax, recharge, play, and rejuvenate. And the on-site Bliss® Spa is an urban escape fashioned with the signature touches that make the Bliss® brand so popular, from an exclusive treatment menu to upbeat music to its beloved brownies. The WET® Deck infinity-edge swimming pool and 24-hour FIT, W Atlanta’s dynamic fitness center, make it easy to have fun and stay healthy in style. The award-winning hotel also boasts a private helipad and offers complimentary W Ride service within a two-mile radius. The Bliss® Spa in W-Atlanta Downtown is a world away from the typical day spa. Bliss receives rave reviews from guests who are looking for serious style when they relax and offers an elevated escape perfect for those who require a serious side of style when they relax. With unique touches like jazzy blues tunes, a legendary brownie buffet and a menu of fun and results-oriented treatments, Bliss® Spa is a stress-free zone for hotel guests and city dwellers. Bliss’ exceptional therapists and aestheticians are dedicated to creating a higher state of happy in the bright and airy spa’s fun, positive environment. Treatments and services include therapeutic skincare and facials, massage, nail, waxing, and body services, such as the Triple Oxygen Facial™, the “Home” Improvement ™ facial for men, and a luscious array of tempting massage treatments, peels, masks and waxes. Mini-treatments are also available, and the spa has separate locker rooms for men and women. With its impressive arts, entertainment, culture and sporting events, Atlanta leaves a lasting impression, and W Atlanta-Downtown gives guests the chance to be in the heart of it all. Historical landmarks such as the Martin Luther King, Jr., National Historic Site, the Carter Center and Presidential Library and the World of Coca-Cola are all within easy reach. Other prestigious sites, including Centennial Olympic Park and the Georgia Aquarium, the Botanical Gardens, Zoo Atlanta and Six Flags theme park are nearby, and sports fanatics can enjoy games year round at the Georgia Dome or Turner Field. W Atlanta-Downtown is also close to fine restaurants, museums, theater and dance venues and high-end and eclectic boutiques. The hotel offers every imaginable amenity, including the Bliss Spa and the 24-hour FIT fitness center, exceptional dining, a complimentary W driver, private heliport, babysitting/childcare services, disability-accessible facilities, business services, Pets Are Welcome™ services, and its famous Whatever/Whenever ® service. Guests enjoy access to the award-winning Starwood Preferred Guest® program. If you are planning a meeting, wedding, or special event, W Atlanta-Downtown’s event planners will help you plan a memorable and flawless occasion. 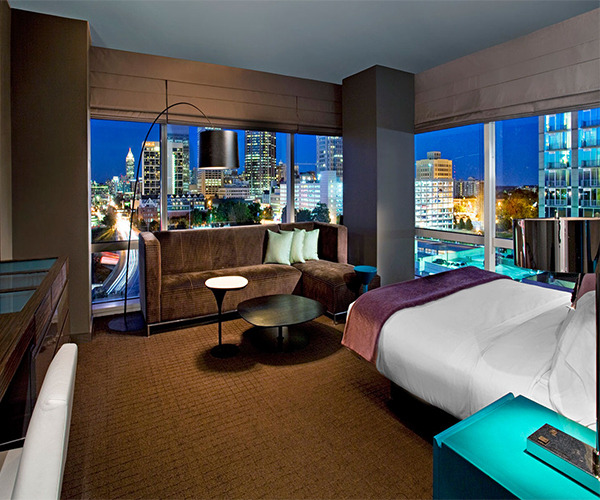 “Fabulous,” “Wonderful,” “Cool Corner,” “Wow” and “Extreme Wow,” guest rooms and suites at the W Atlanta–Downtown exemplify the boutique hotel’s sleek design aesthetic and impeccable attention to detail. All accommodations feature W’s signature W bed and W pillow menu, goose-down duvets, 350 thread-count linens, high-speed Internet, state-of the-art in-room entertainment, and bathrooms equipped with rainforest showers and sink-side Bliss Spa product sampling. A range of dining and bar options is available. W KITCHEN’S menu of innovative American cuisine is made from local and seasonal ingredients, and the trendy LIVING ROOM lobby lounge, serves W signature cocktails in a spectacular setting. WETBAR is Atlanta’s only all-weather rooftop pool bar, and DRINKSHOP is available for private events.